Christmas and New Year are been and gone, done and dusted, but the year is still young and full of possibilities. Weather being one of the things that affect us, this year started off with a serious storm combined with the highest tide we’ve ever seen. On an exceptional spring tide my seawall gets topped by a few millimetres, there will be a puddle or two on the grass but that’s all. This time though the “Wolf Moon”, that is a full moon when the moons orbit is at its closest to the earth, combined with a spring tide pushed higher by a storm driven onshore wind, and that exacerbated by the low atmospheric pressure associated with the storm meant that at high tide we had the water about 300mm higher than any previously seen. It didn’t come up to the floor of the boatshed, but I’d spent the morning running around lifting lumber, power leads, storage boxes and such, and watching as the level rose and rose. At its peak it was about 100mm over the dock, and 300mm over the grassy area where just a few days before, our daughter and family had been holidaying in their tent. That would have dampened their spirits! So, no damage, other than chasing the neighbours kayak down the river and bringing it back, but I’m told that this is likely to happen more frequently in the future. Both storms coming down from the tropics impacting the coast here and the tide surges that they push. I see that there are areas of the Tasman and Pacific, out there in the open ocean that are up to 6 dg C warmer than normal, that’s a lot, and the heat energises those storms which in past times would have run into the cooler waters and dissipated. So, although where I am, we’re pretty sheltered, it’s a sobering thought. Tropical cyclones and super king tides, I have double dock lines and am making moves to shift things up out of reach of the weather and water. A bare three days before this hit, Daughter and family were here for a few days, camping up on the grassy area at the end of my dock. We all of us had a good time, the two girls ( 3 and 8 ) getting their first taste of being out on the water in a small boat. Sarina taking her girls out in Dennys sit on top kayak, beginning lessons on paddling for 8 year old Aysha who might be up to a solo next time she visits. There are times when being a grandfather is one of lifes best treats. 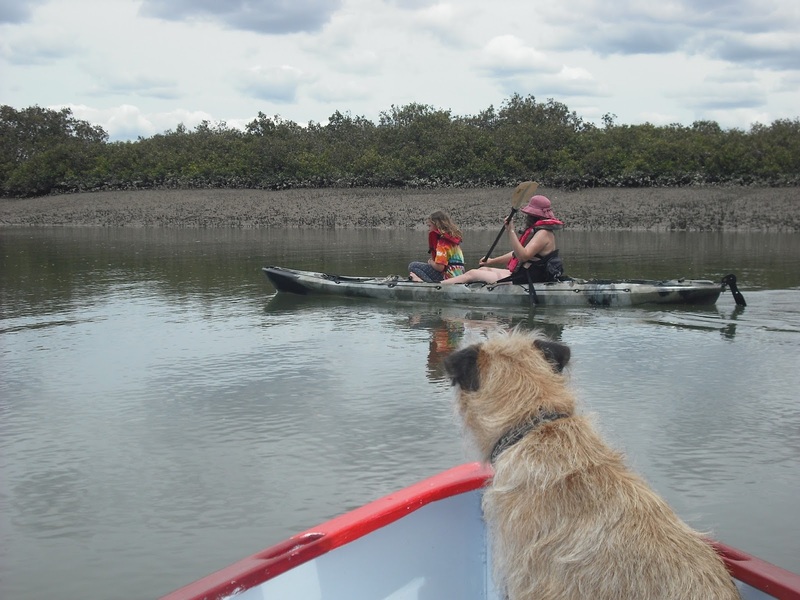 Thats our daughter Sarina and her girl Aysha out in Dennys 'yak, Indy the dog watching to make sure that they're ok, while I stay close enough to be there if needed but far enough away to have them think that I'm confident in their abilities to stay upright. It was evident after a few minutes that my concern was unwarranted, but it was really nice to be out there on the water with them. We took the family out to Tiritiri Matangi island, about 15 miles away. Thats a bird sanctuary run by our Dept of Conservation which, with the help of a team of dedicated volunteers have reforested most of the island with native flora, then introduced rare and endangered birdlife. Its a lovely place to visit, http://www.tiritirimatangi.org.nz/ Extraordinary scenery and the birdlife is not at all bothered by people so they can be viewed from quite close up. There are several events coming up, one being the Mahurangi Regatta on the 3rd of Feb, that’s one I cant miss, 250 or so classic and small boats parading ( they call it "racing", but its too close in to get really serious) up and down the river, meeting friends on the beach, sailing a small boat in among all those lovely old vessels, it’s a great day out and one that I have attended regularly for many years. I’m hoping to get Spook out this season, she’s been sitting under her tarp feeling neglected for the past couple of seasons, so in a week or so she’ll be towed around to my mums place where I can get an electric lead to her, have all her varnish sanded off and recoated, the trailer checked out, her rig overhauled, and a few other jobs done so I can keep her on a mooring for the summer. Within a few hours sail of here I’ve a choice of some thirty sheltered anchorages, friends on several islands, a part of the coastline that I’ve not explored for many years to look at, and its past time I was out there sailing her again. We’re planning to do another sail across to Kawau Island in March, I think I can make that ok, Spook will take maybe three or four days to get sorted, I can launch her at the yacht club at the mouth of the river and bring her up here, set up an anchor off the end of the dock and put a running line out. Denny is here for the weekend, I’d promised her something special as Christmas pressy, we’re all booked, and she’s not got a clue as to what it is I’m planning, it should be fun, its something really different. I’ll report later on. Long Steps is making progress. Slow and not very steadily but there is progress, this morning I glued parts of the cockpit sole in, the “wing” pieces out to the sides in the cuddy. I’ve started the tedious task of coating everything that wont be seen once the “tops” go on, have begun the tiller pivot structure, and have begun painting the patches that will be behind some of the fittings that have to go on early while the backs of them are still easily accessed. 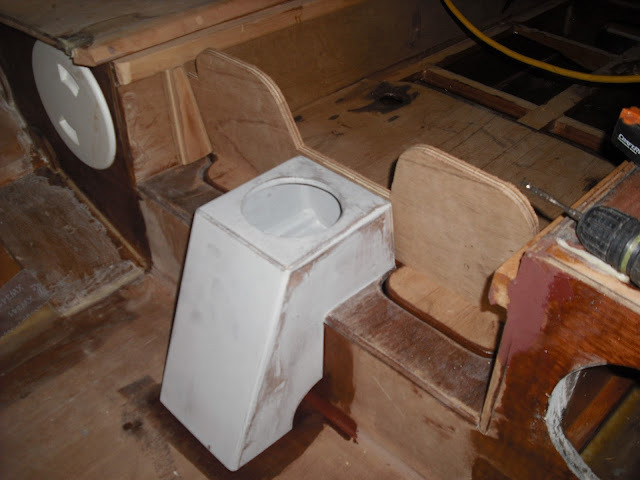 The compass binnacle, it hides the scupper into the footwell ahead of it, plus supports the rowing footrest ahead of it. That footrest will be hinged to fold down flat to enable me to move back and forth past it without tripping over it. Yes I know, I should have thought of it before I put the king plank in, but a large part of boatbuilding for me is sort of "thinking aloud" and I hadn't quite figured out how I was going to pivot the tiller or to mount the boomkin before I put the tiller line tunnel in. Now I've thunk it through the tiller will pivot on a pin going through between that rectangular piece and the curved piece underneath it, the after deck will curve around and over the rectangular bit which is to be trimmed back some. Note that the tiller pivot will slope to match the slope of the rudder pivot so I can use solid pushrods between the yokes rather than lines. Why? I've not done it that way before and want to try it out. 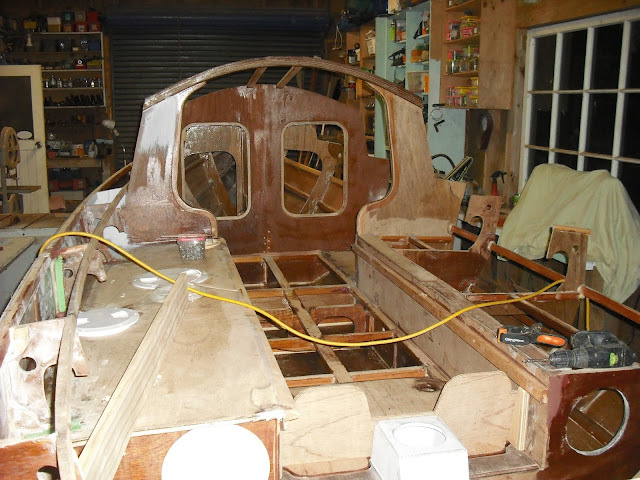 Note that the cockpit floor doesn't get fitted until the boats been rolled over and the skeg fitted. 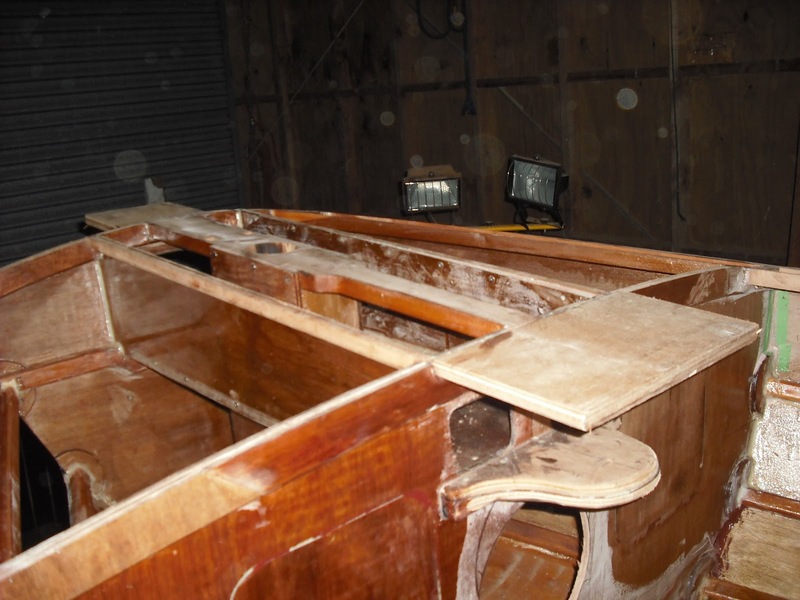 While she's upside down the bottom will be fiberglassed and she'll be painted up to the gunwale. I'm not looking forward to the job of flipping her, but it will happen, the plan is to suspend her at each end from the rafters and just spin her, then sit her on some padding of some sort. There's lots to do before that happens though.